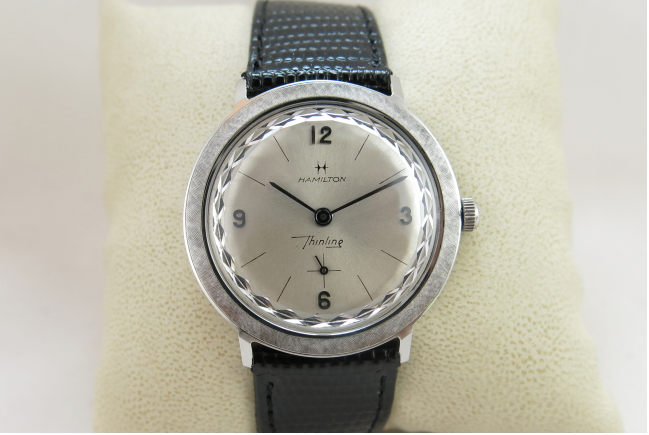 Introduced in 1953, the Hamilton Cranston was produced for only two years. It's very similar to some other period models, like the Boulton, except the Cranston is a little bigger, or wider anyway. 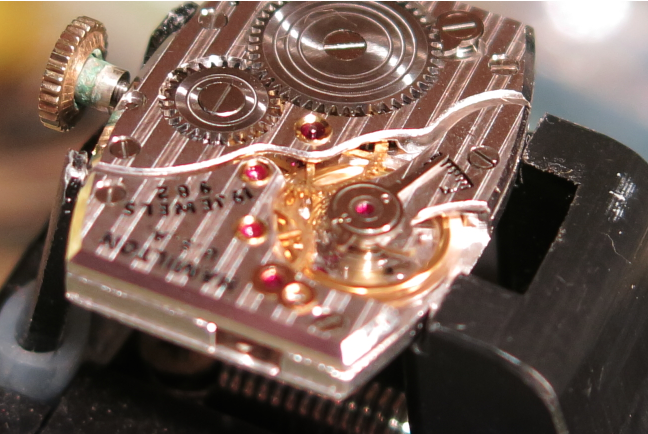 The Cranston features Hamilton's newly introduced 19 jewel, 12/0 sized 753 movement. 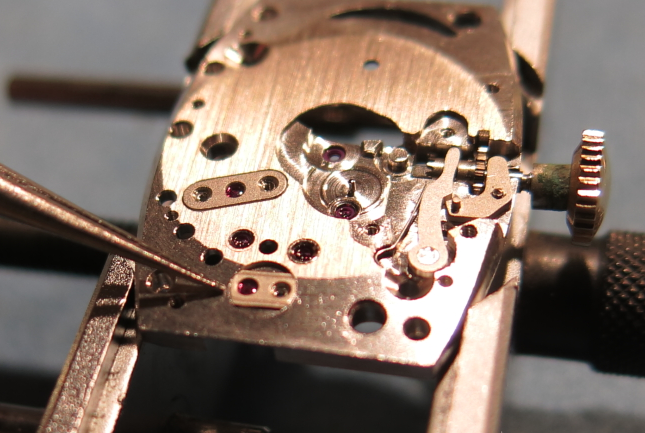 The 753 replaced the 19 jewel 14/0 sized 982 movement. Some 982 models that were made in 1953 became "B" varieties... like the Boulton B for example. 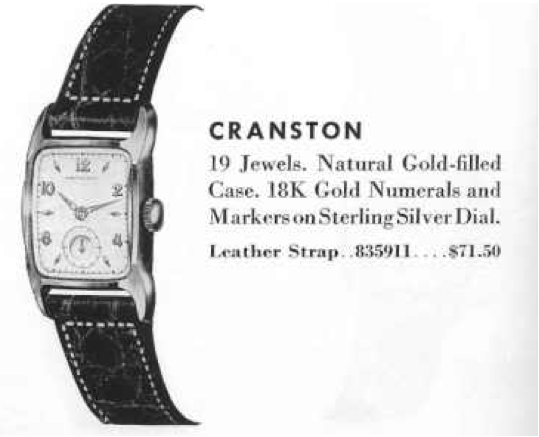 The Cranston also offers a beefy 10K gold filled case with lots of angles. Back in my Navy days I would have described it as "stealthy". It also has an 18mm lug width so it accommodates a substantial-looking strap too. The dial is sterling silver with solid 18K gold numerals and markers. 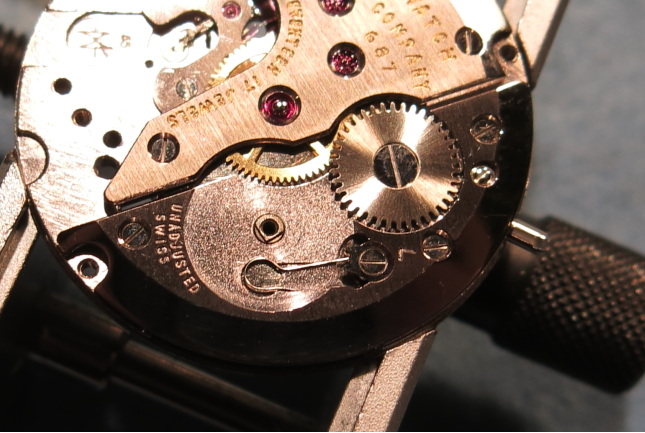 The numeral / marker dial is one of the best clues to identify a Cranston from other similar shaped models. I recently picked up a Cranston at one of my favorite local jewelers. It came on a garden-variety Spiedel expansion bracelet so I was happy to remove that and outfit it with a nice genuine lizard strap. After a thorough cleaning, it's running as great as it looks! 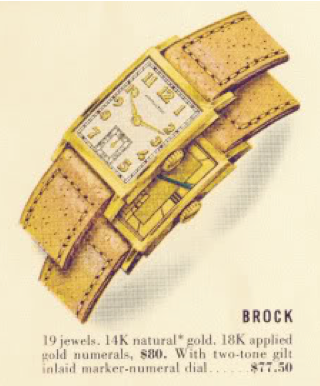 The Brock was released in 1939 and made until 1952 (with an interruption due to WWII). 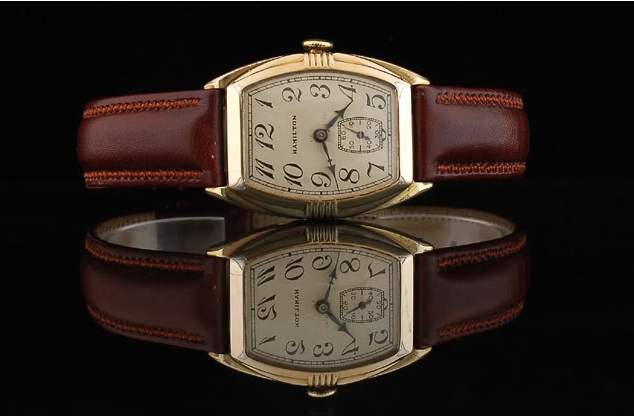 It's a solid 14K gold tank-style watch with a choice of AGN dial or a two-tone gilt dial. 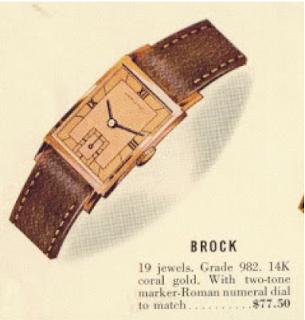 However, in 1940 (and only 1940) the Brock was available in a solid coral gold version (also known as rose gold). 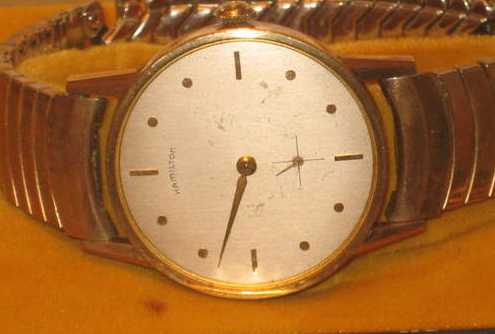 It came with a two-tone enamel copper-colored dial with Roman numerals. The Coral Brock also features black baton-style hands. 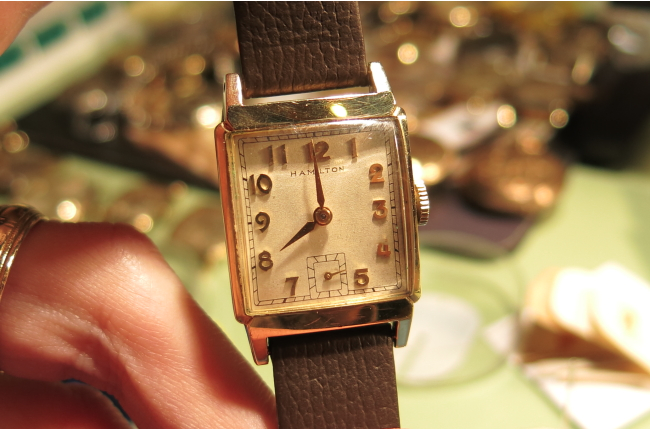 The 1940 Coral Brock (and the yellow gold versions too) came with a 19 jewel, 14/0 sized 982 movement. 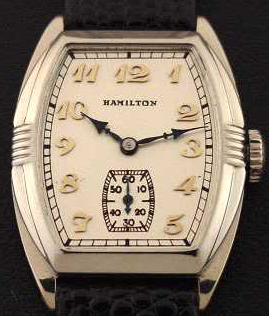 In 1941 Hamilton introduced the 982M (as in Medallion) movement that would be used in solid gold watches. But in 1940 and years prior, all solid gold 14/0 sized watches got the 982 movement while gold filled models got the 17 jewel 980. I recently had the opportunity to check out a Coral Brock and it's a very distinguished-looking watch. It's not very large, especially by today's standards so a woman could easily wear it as well. They're not very common so it was great to have a chance to see one in person. If you ever happen to find one, I think the most challenging thing you might realize about them is it's just as hard to obtain a matching rose-gold buckle for the strap... try finding one of those! 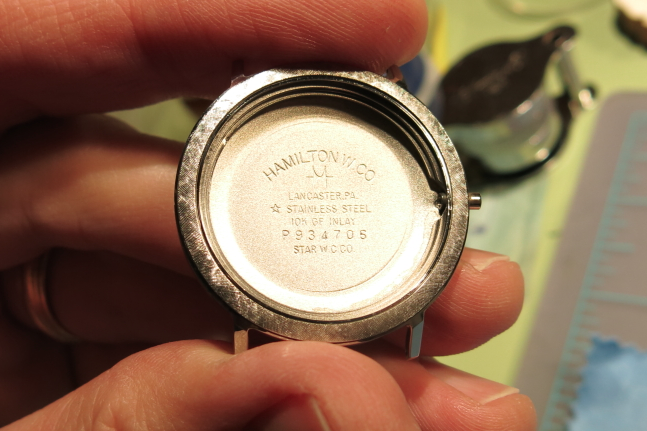 Part of Hamilton's higher end Medallion line, the 1958 Norman was the second model to bear the Norman name. The first Norman was created in the 1940's. 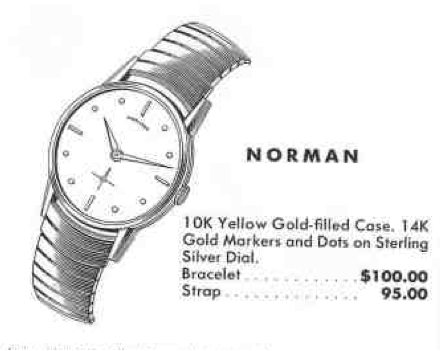 This Norman features a 10K gold filled case in yellow with solid 14K gold markers and dots on a sterling silver dial. 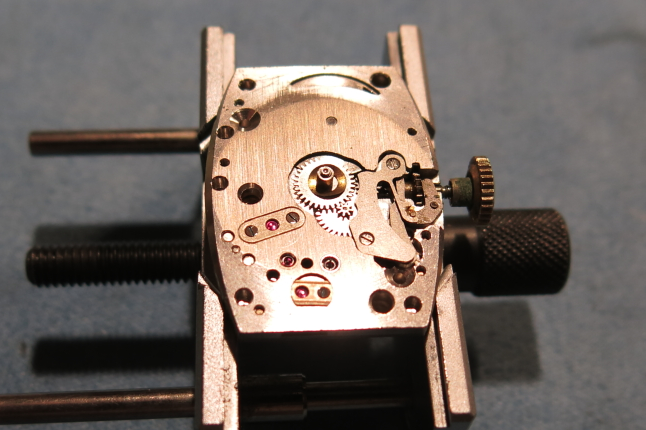 Under the dial is Hamilton's 22 jewel, 12/0 sized 770 movement. I recently found a nice Norman on eBay in need of a little TLC. 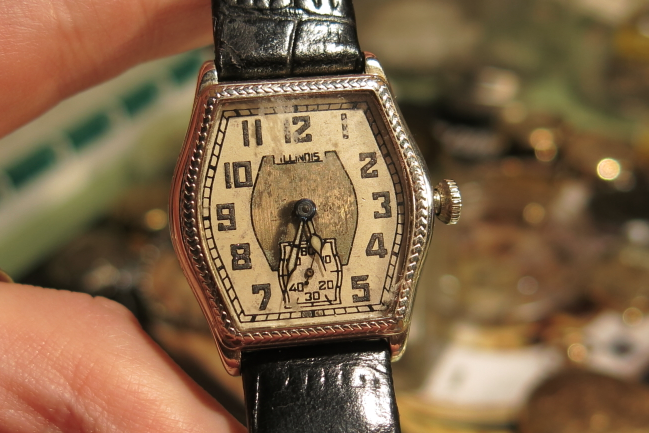 It was missing it's crystal and hour hand and the dial was starting to develop "dial rash" or abrasions from a lack of a crystal. The nice thing about my example is it also came with it's original bracelet. With it all cleaned up and with a new crystal and hour hand, I think it turned out to be a great project watch. I'll have to try to find a slightly longer hour hand though I think. 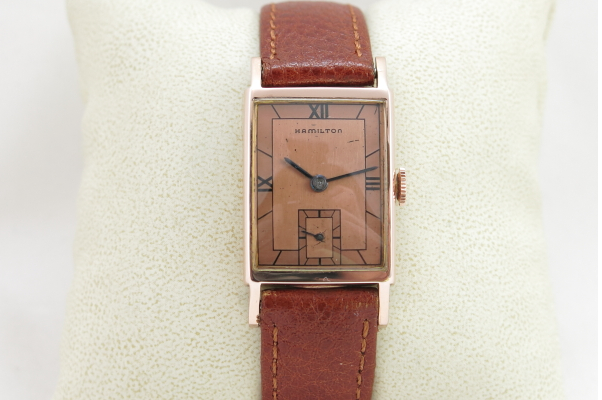 There have been three Hamilton models called the Perry. The first one was released in 1931 and produced for four years. 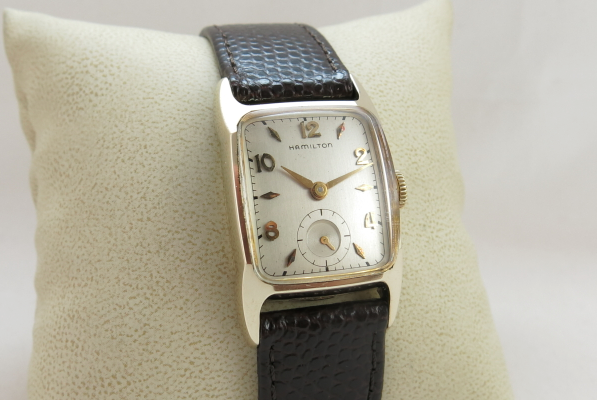 Like other watches from this period, the Perry came in yellow gold filled or white gold filled. 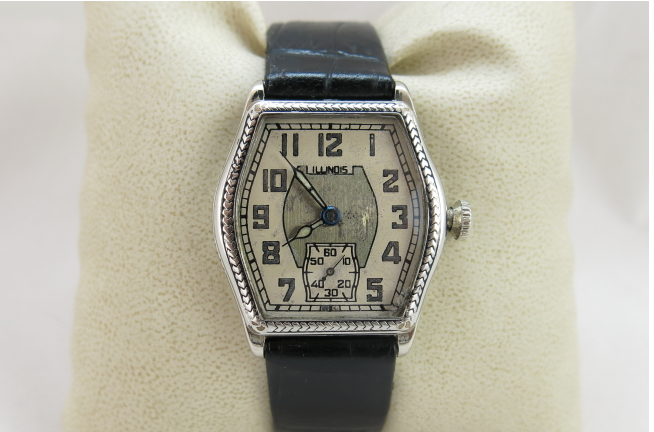 Depending on the year, three different dial options were available too... a luminous dial, an applied gold numeral dial, and a black figure (enamel) dial. I think the latter is least common and draws a healthy premium. 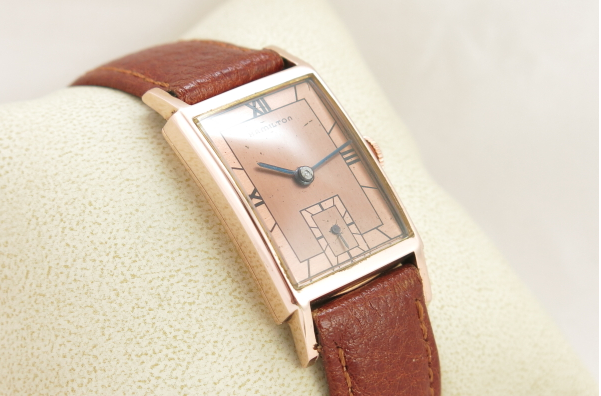 The Perry is a large watch, especially by vintage watch standards. 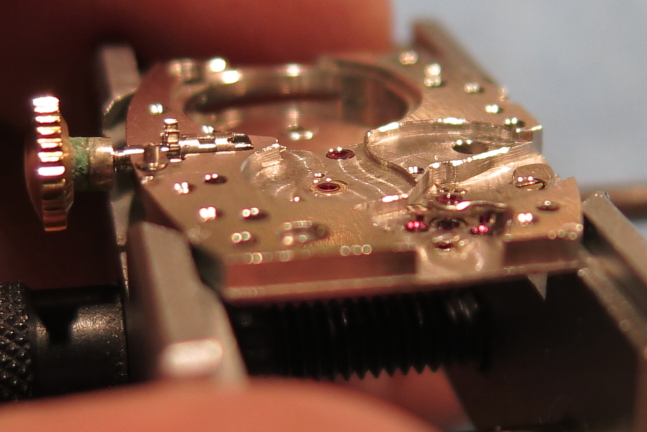 It utilizes the 17 jewel 6/0 sized 987F movement (maybe a 987 if it's an early version). 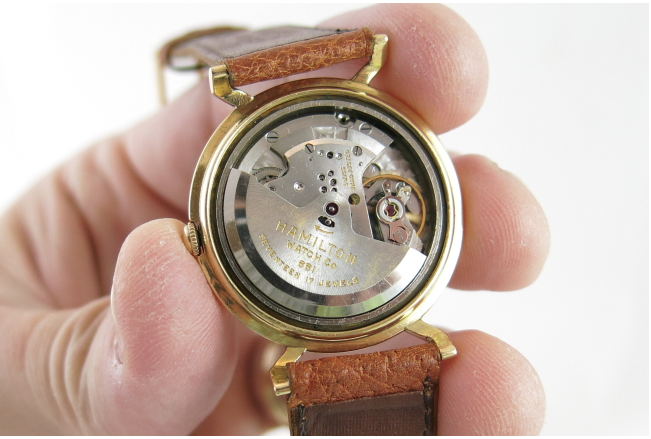 It's barrel shaped bezel is similar to other watches made in the same period so the easiest way to identify a Perry is by the horizontal fluting on the side of the bezel and case at the 3 and 9 position. 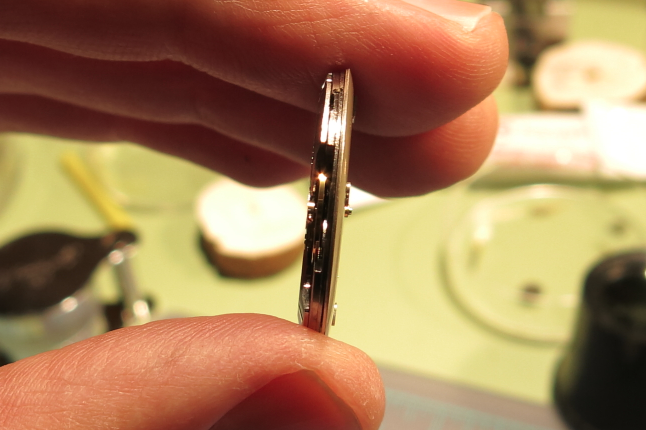 Wear through is very common to the corners of the bezel. 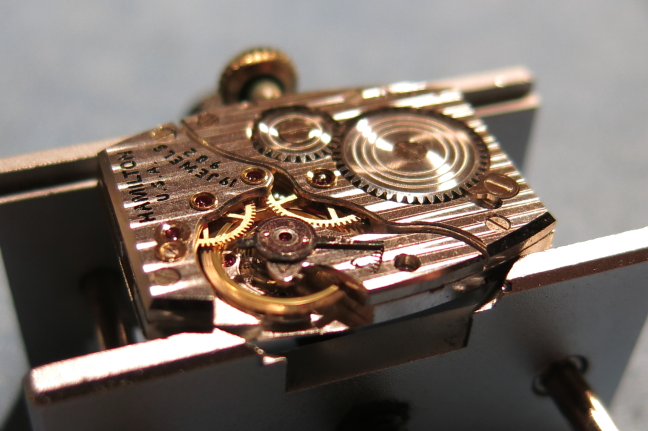 I've also seen examples with considerable wear to the edges of the case back. However, you very rarely see a Perry without at least a little wear to the bezel. 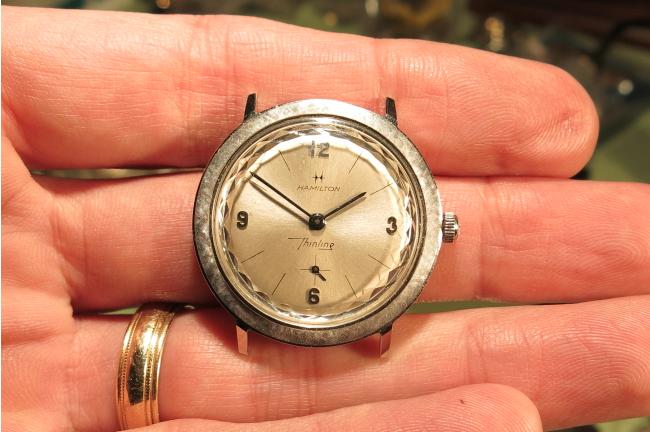 I recently restored a white Hamilton Perry and it was a great example of a "diamond in the rough". 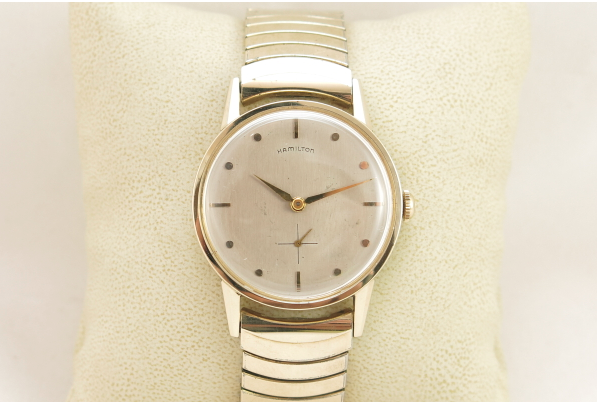 In the before-state, the watch was not running and had a cracked plastic crystal and very poor dial. The crown was also a replacement and not really a good match for the model. The movement was a rusty mess. In fact, I was surprised that I was able to restore it to excellent running condition. 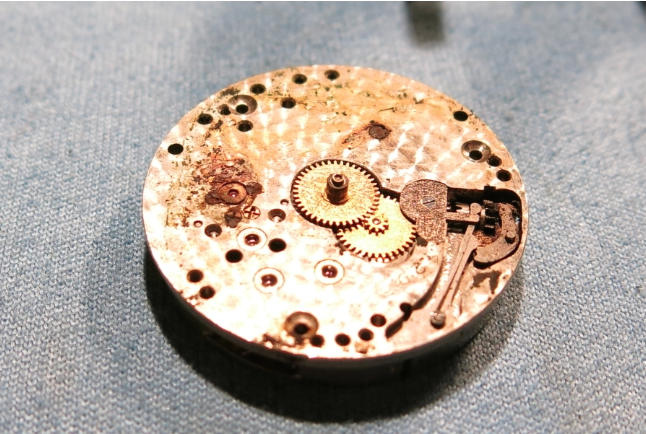 If the hairspring on the balance gets rusty the watch is probably going to be a lost cause. Most of this water damage was constrained to the dial side and the stem area. 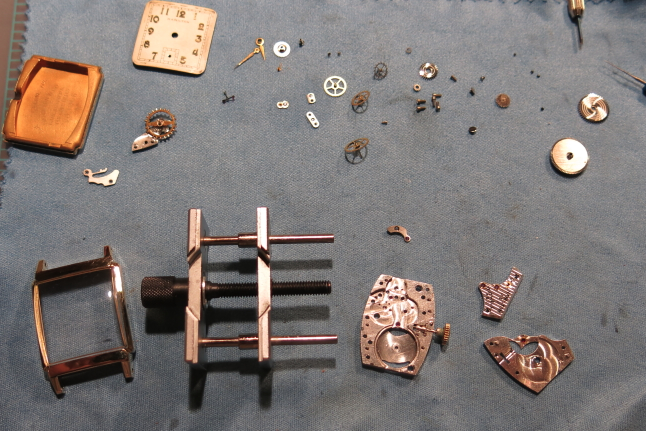 Pretty much all of the winding and setting parts had to be replaced, as was the mainspring arbor. 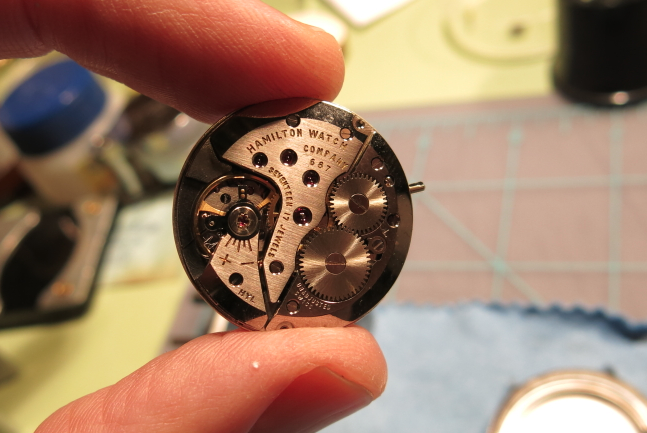 After the movement was overhauled, I sent the dial and hands out to be professionally refinished. The hands are not exactly correct but they still look very nice, so who cares? I also installed a new glass crystal. A new stem and more appropriate crown completed the exterior restoration and with a new black teju grain strap, this Perry is a dramatically improved watch! Here's a couple of other very fine examples of Hamilton Perrys. 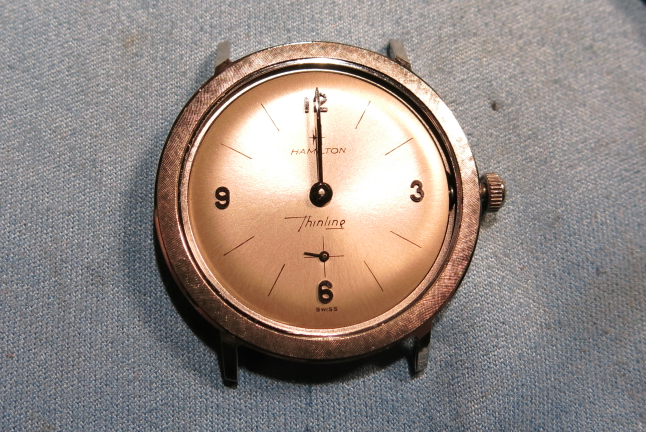 This first one exhibits the black figure dial. Complemented with the black spear hands, this watch is a striking model and looks fantastic with a deep brown calf skin strap. 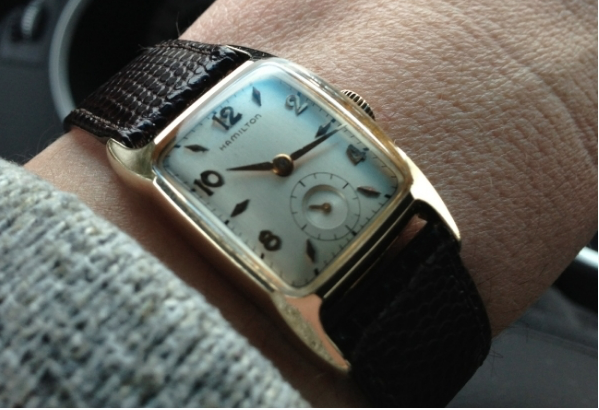 Here's a nice example of a white Perry with the AGN dial. 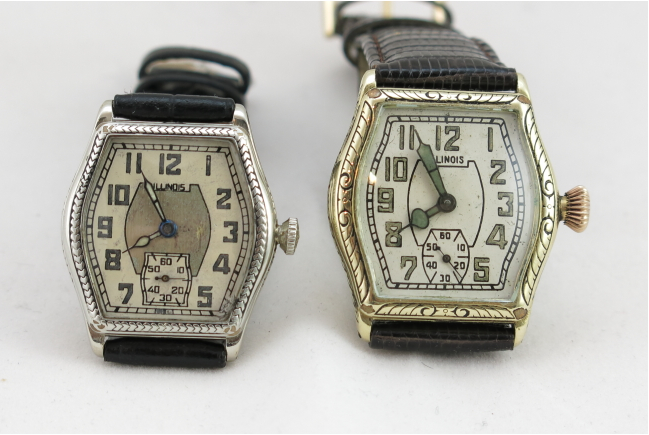 As a general rule, white watches with AGN dials got black hands. If this watch was a yellow gold filled version, it would have had gild (yellow) hands. 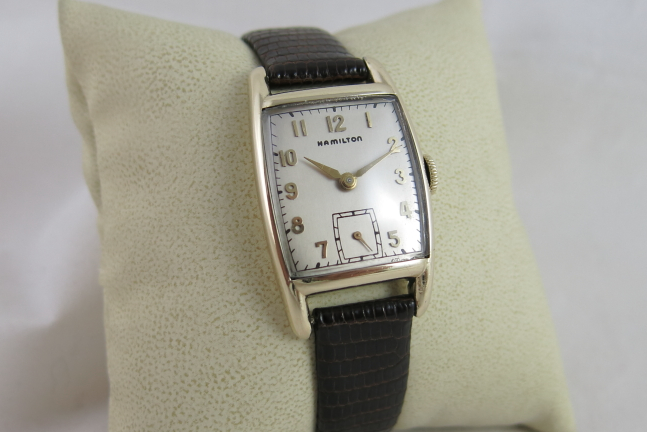 In the late 1950's and 1960's Hamilton utilized a variety of Swiss-made movements that allowed them to produce a broad array of ultra-thin models. Automatics were made as part of the Thin-o-matic line and manual winders were a part of the Thinline series. These watches came in all sorts of shapes and sizes and in a variety of materials too. On example of a stylish manual winder is the 1963 Thinline 4500. It was produced for only two years. The Thinline 4500 has a one-piece case with a 10K white gold filled bezel and an integrated stainless steel back. 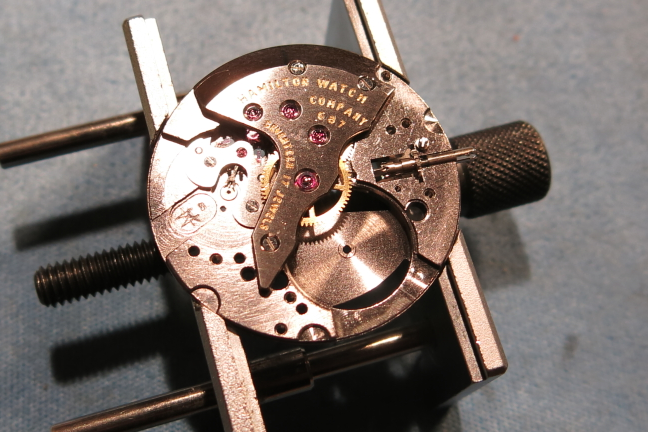 The dial is accessed by removing the decorative faceted crystal. The silver dial is accented with very thin black baton-styled hands that complement the watch's thin-style. I recently overhauled a Thinline 4500, so I will show you how it goes. Starting off, the watch was in very nice over all condition. 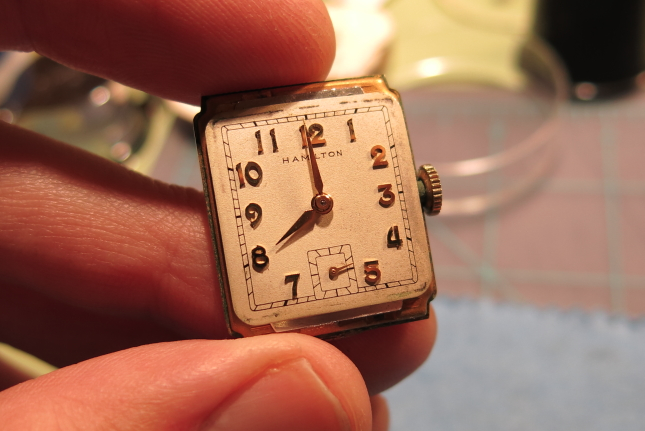 Behind the dial is a 17-jewel Swiss-made Hamilton 687 movement. You can see the female portion of the two-piece stem that allows the movement to be pulled out the front. The male portion is installed in the crown. 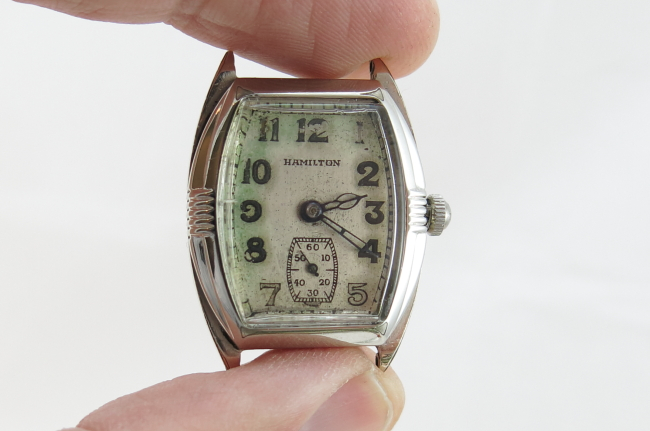 The case has no watchmakers marks inside the back, but there is one on the outside. 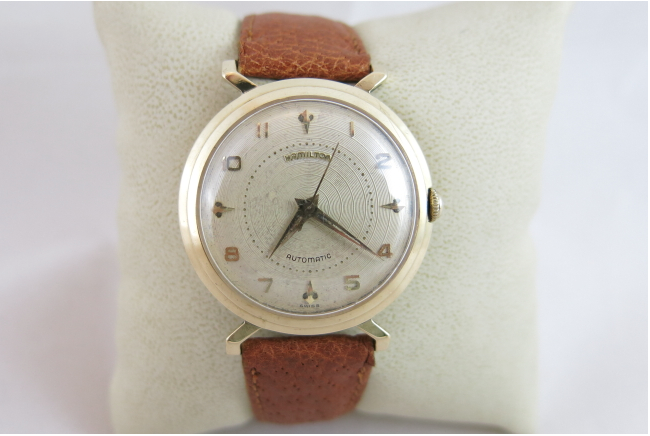 That would say that this watch has been overhauled at least once in it's 50 years. Once it's all disassembled, everything gets cleaned and is set out to dry. The first things to go back in are the pallet fork and then the four wheels, starting with the escape wheel and ending with the center wheel. The train bridge incorporates all four wheels - so getting them all lined up can be tricky. Fortunately since the wheels have very short arbors they're not as hard to line up as other four-wheel bridges like on the 748 movement. 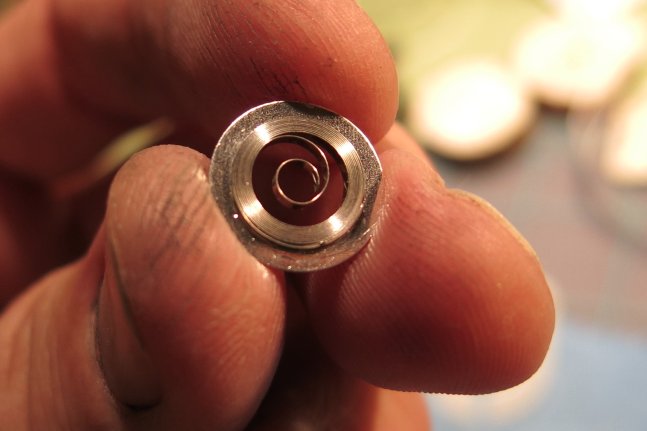 Next in is the mainspring barrel and it's bridge. If you look closely you may note that the click spring is missing. 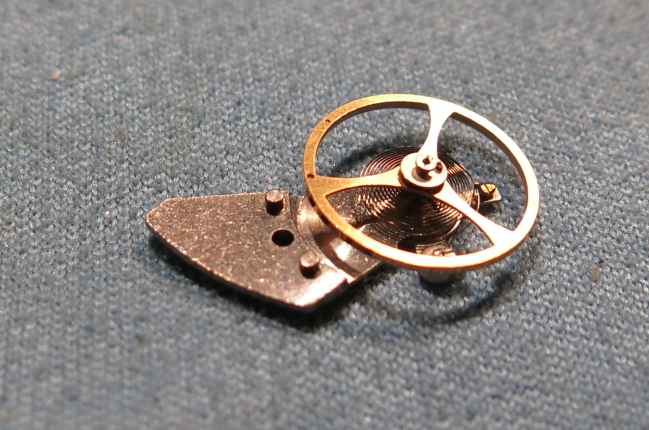 The click is what you hear when you wind the watch and it engages the ratchet wheel (the larger of the two wheels) and keeps the mainspring from unwinding back through the stem / crown. 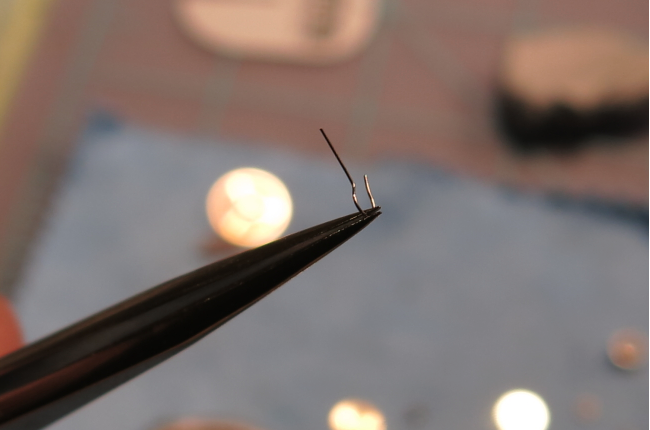 The click spring fell out in the ultrasonic cleaner. It's not very large and care must be taken in putting it back - as click springs like to shoot out in any random direction if you're not careful. Here it is, back installed. So the ratchet wheel can go back in now. 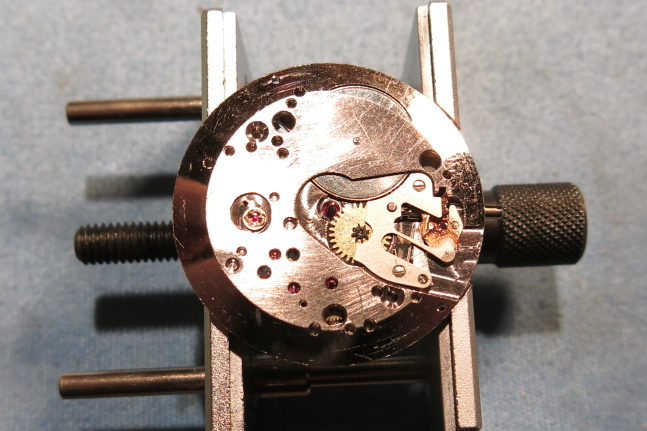 With some tension re-applied to the mainspring, the next thing to go on is the balance assembly. 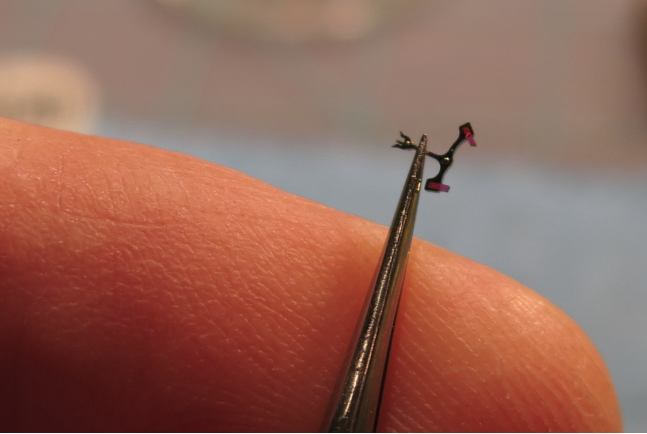 But first, the jewel in the balance bridge jewel gets a tiny droplet of oil. This balance wheel is machine poised at the factory so there are no adjustment screws. You can see tiny holes where ever-so-slight amounts of material have been removed to make sure the wheel and hair spring is properly balanced. 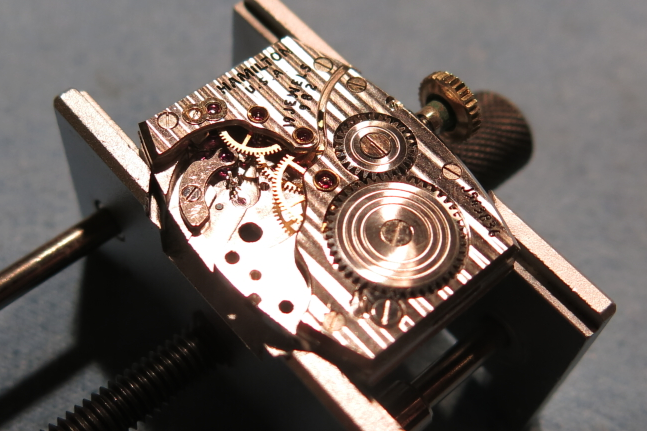 Flipping the movement over, the setting wheel and minute wheel go back on and everything is lubed with fresh grease. On the timer, the watch started out running a couple of minutes fast but after a little tweaking to the regulator it's back to running great at 4 seconds fast per day. In this shot you can see why they called this the Thinline series. 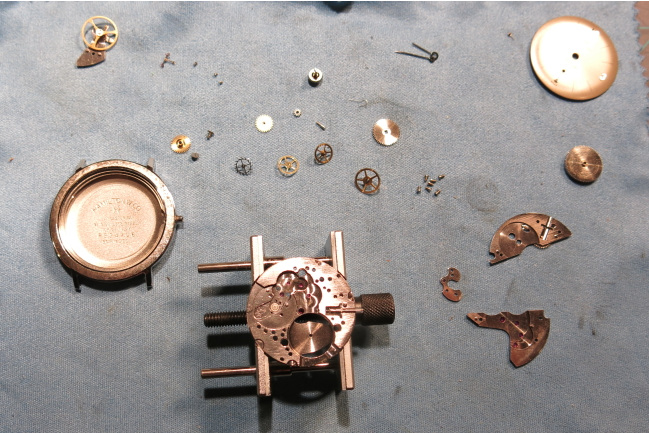 The dial goes back on and the movement is reinstalled in the case. Then the hour and minute hands go on at 12:00 so they're assured to be lined up correctly thereafter. The Hamilton Dennis was introduced in 1948 and produced for four years. It's very similar to a few other models from the same period... like the Alan and Boulton. 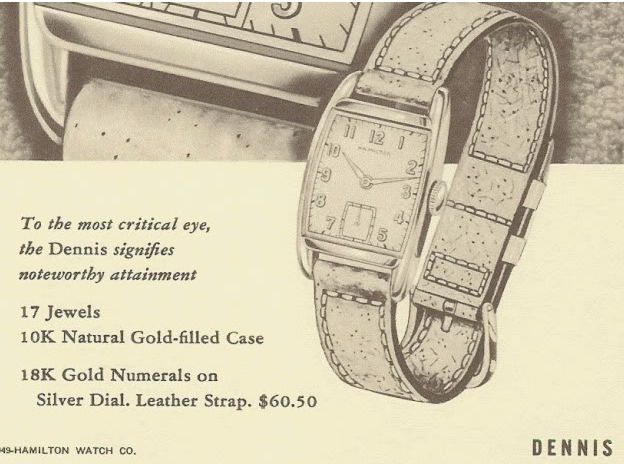 The Dennis came in a 10K gold filled case with a sterling silver dial with solid 18K gold numerals. 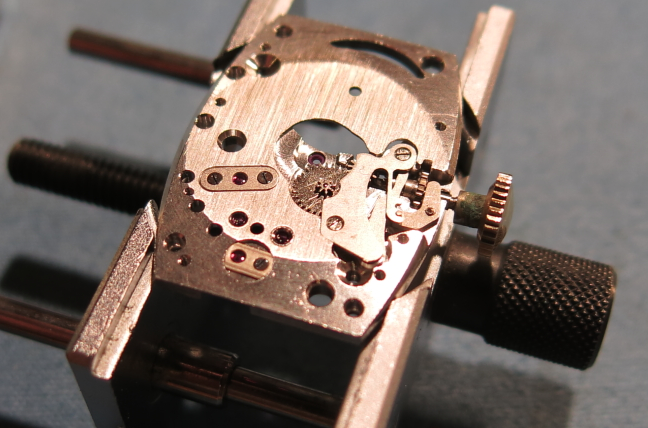 Behind the dial is a 14/0 sized, 17 jewel 980 movement. One odd thing about the Dennis is that it takes a narrower strap than other models... it's 14mm by today's standards. For today's man, I think a 14mm long strap is the best option. Here's an example of a Dennis that I restored last year for a friend of mine named... you guessed it - Dennis! For decades Hamilton used men's names as model names. 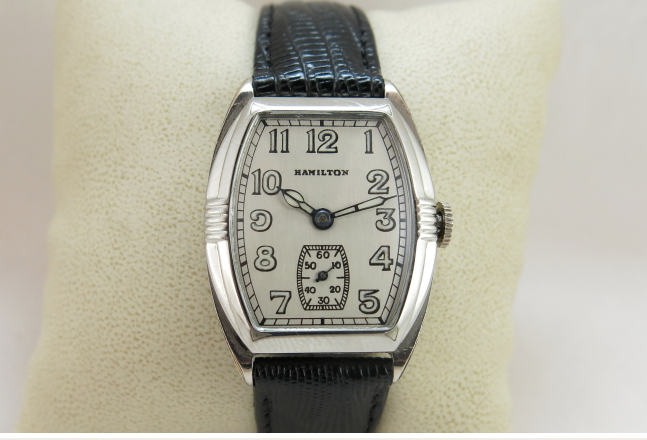 Despite this prevalent trend and even though there are lots of names that were never used, Hamilton adopted a numbering approach to many watches in the 1950's. A good example is the 1955 Automatic K-150. This watch was made for three years. Hamilton's approach to numbering involved using the first number to denote the case material. 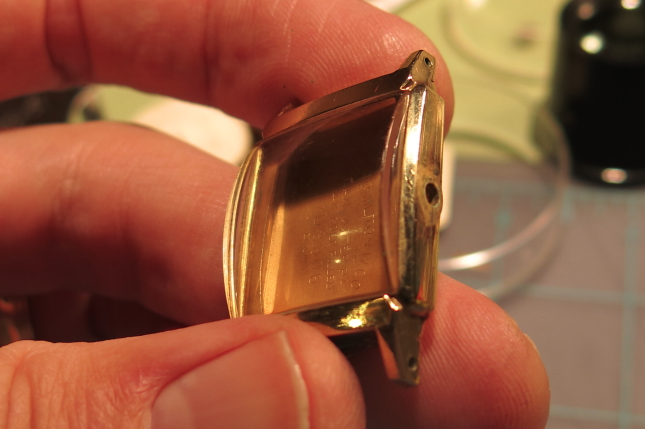 A 1 was used to indicate 18K solid gold as the case material. A 2 represents a solid 14K gold case. A 3 is solid 10K gold, 4 is gold filled and 5 is stainless steel. 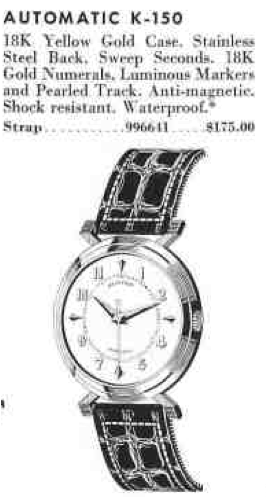 Another interesting factoid is if the second digit has a 5, then the watch will have a stainless steel back. Understanding that, you would probably guess the K-150 has an 18K solid gold case with a stainless steel back - which it does. I recently had an opportunity to overhaul a K-150 for a friend. It was a treat for me since I don't tend to see solid gold watches unless they are in a shop. 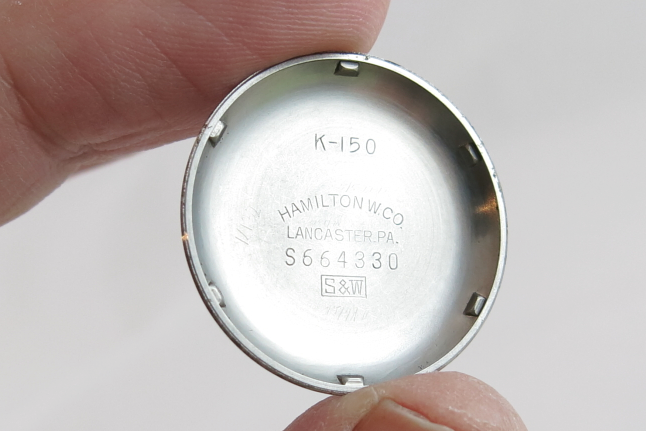 The K-150 has an textured dial with an embossed Hamilton logo and solid 18K numerals and markers. The pearlized minute track is inside the numerals circumference so the watch features a shorter second hand to align with the smaller diameter. 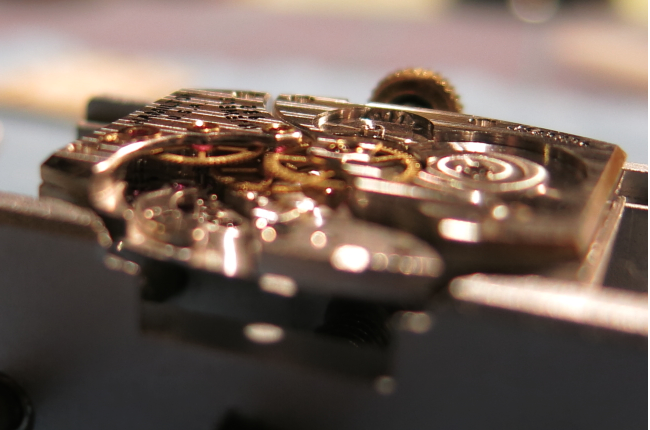 Behind the dial, you'll find a Hamilton 661movement. Identifying models can sometimes be a challenge but a good percentage of the time the model name is stamped inside the case back. 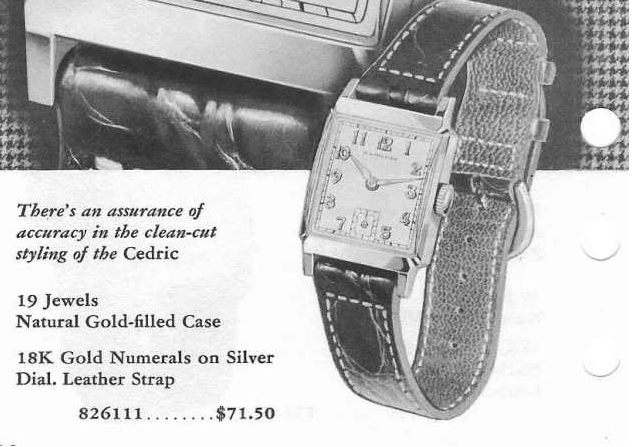 In 1950 Hamilton introduced the Cedric, a very clean designed rectangular watch. It was produced for three years. The Cedric came in a 14K gold filled case with a white-finished silver AGN dial with solid 18K gold numerals. 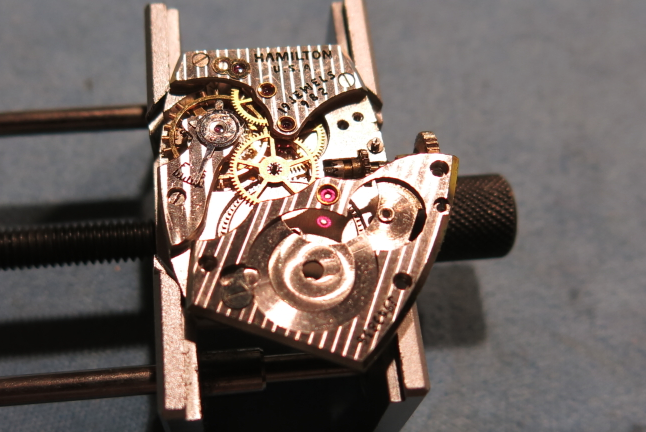 It featured the 19 jewel, 14/0 sized 982 movement. The Cedric is a pretty solid watch in my opinion. It's fairly easy to find and usually is in good shape. I don't know if its the sturdy rectangular design or the prominent crystal, but good examples are plentiful. 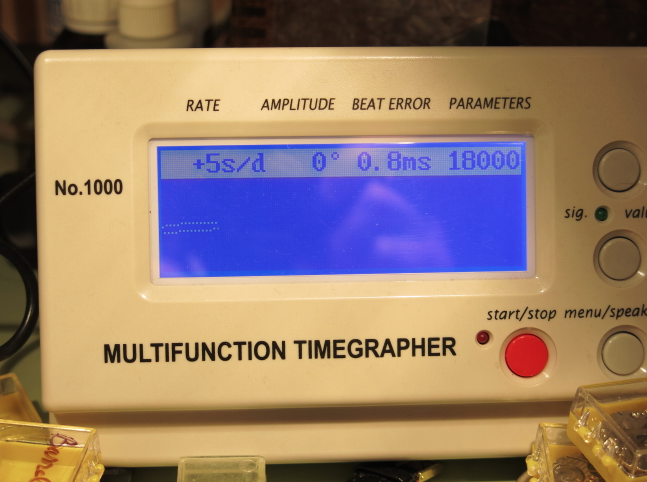 The white finished dial can often show a lot of dirt and they're tricky to clean without losing the printing. 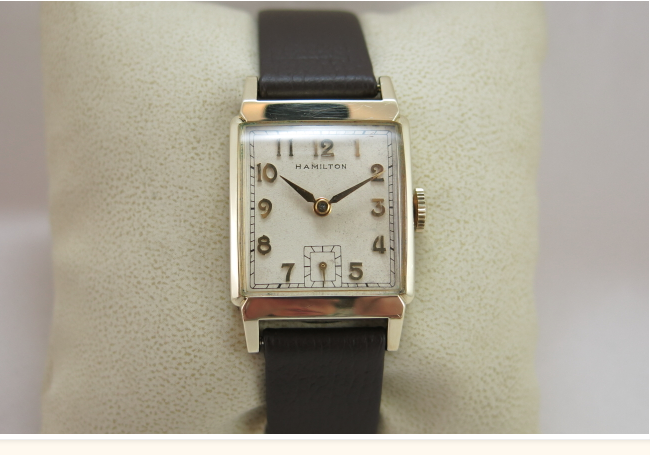 So about the only thing an old Cedric needs to look good as new is a new crystal and a refinished dial. I recently had an opportunity to overhaul a Cedric. It was in pretty good shape but was not running. The balance staff was solid so I was hopeful all it needed was a good cleaning. With the movement out of the case, the first thing to do is to remove the hands. The second hand will come off with the dial. 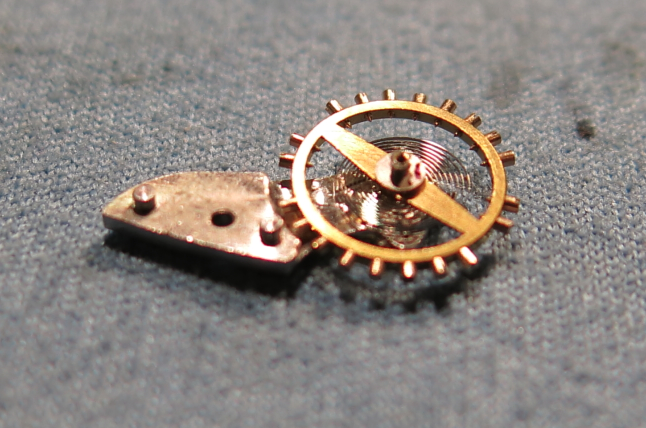 Two small screws on opposing sides of the movement hold the dial on. Just a few turns and the dial will come right off. I looked in the case back and it appears this watch was serviced in late 2011. It looks very clean with a hint of microgliss lubricant still on the set lever. The cannon pinion, hour wheel, minute wheel and setting wheel all come off at this point. With the first parts off of the front, I'll turn my attention to the back. 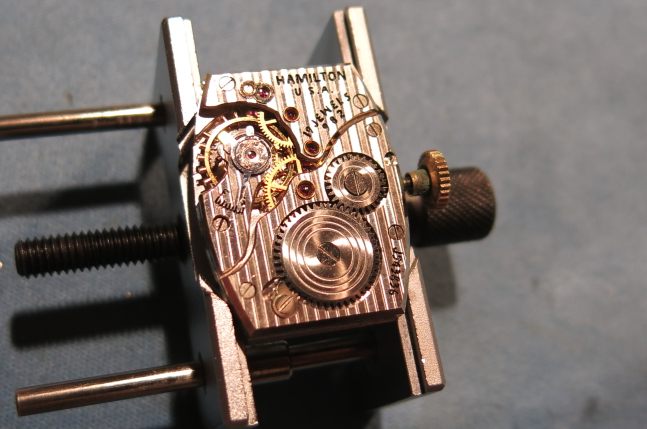 This 982 is nicely damascened with a striped pattern - that's a nice finishing touch to a part of the watch most people will never see and indicative of the fine quality of Hamilton movements. Three bridge screws are removed as well as the ratchet wheel and winding wheel - that cleans off the barrel bridge and allows it to be removed. Two screws on the train bridge are loosened and the train bridge is removed. All the wheels in the gear train are exposed and can be taken out. The balance comes off next, leaving just the pallet fork to come out. 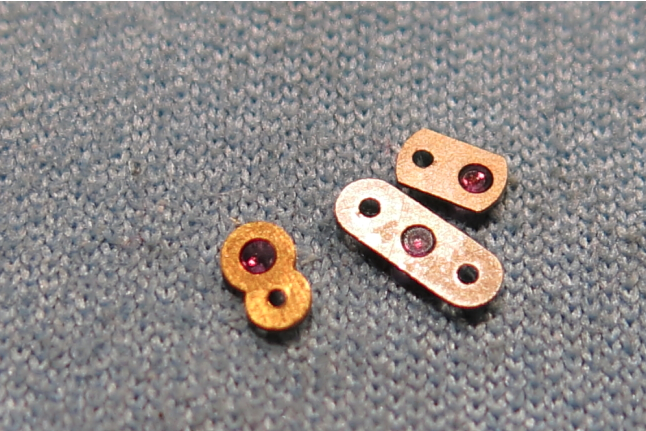 The pallet fork is very small... if these two ruby jewels get damaged or misaligned, it can prevent the watch from working. This one looks pretty good though. The back of the movement is now clear of parts. The last thing to come out are the three cap jewels... two on the front and one on the train bridge. 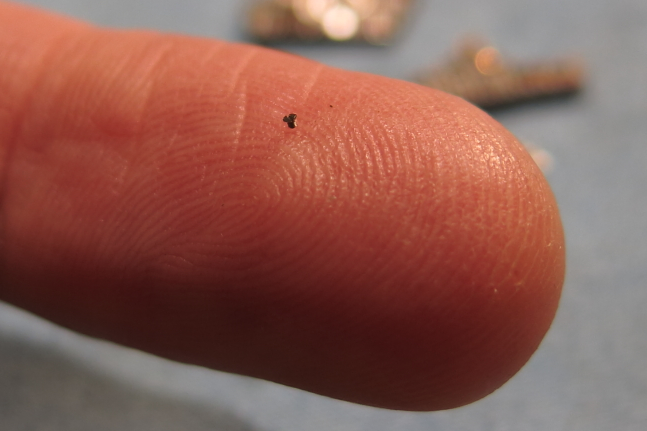 The cap jewel screws are fantastically small. How would you like to have to make these again? This is the reason you never take apart a watch over a rug or porous floor. If you drop this, you will NEVER find it again. Here are the three cap jewels, ready to be cleaned. 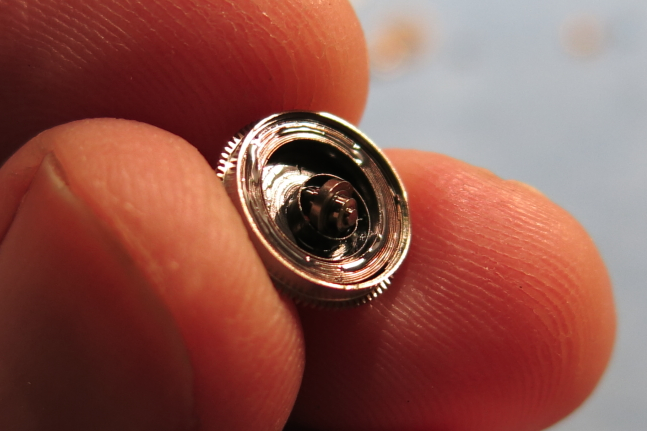 I'll take the opportunity to check out the mainspring. It's obviously lubricated but it's really dirty - so I'll pull the mainspring to see what it looks like. Yup - it would be good to replace it. 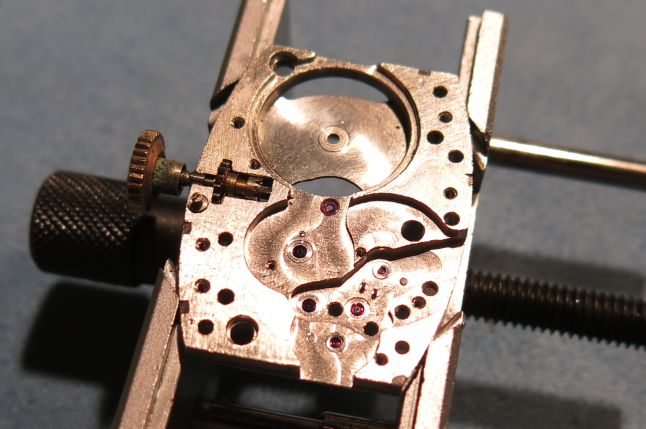 This watch will run WAY better with a new mainspring. While everything is being cleaned I will polish the case. 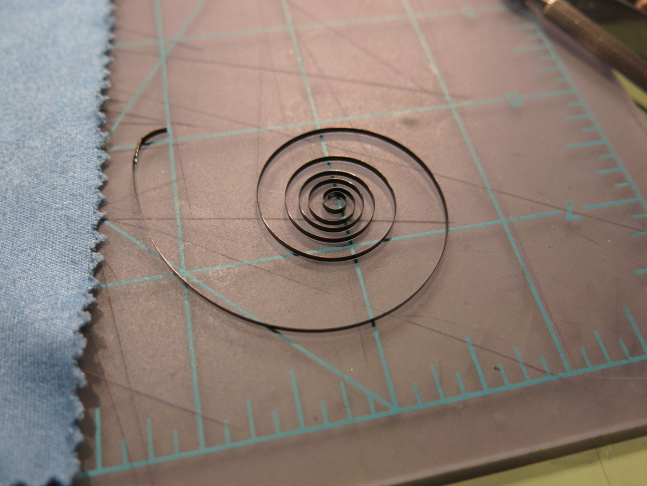 A new white-alloy mainspring comes pre-coiled. You get one shot to push it into the barrel, otherwise you'll need to rewind it and try again. And here it is installed in the barrel. 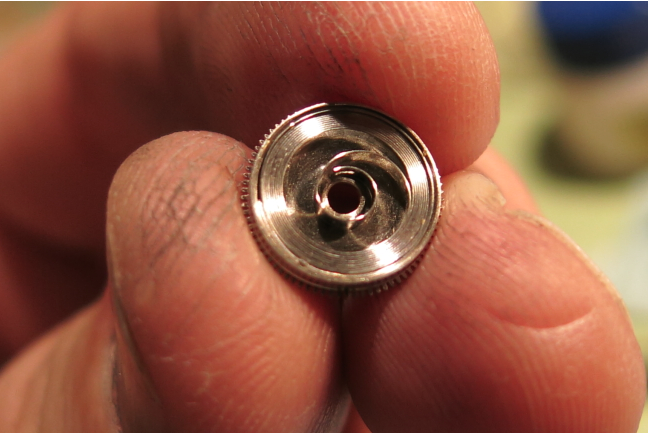 You need to put the spring in correctly for the proper rotation of the coil - otherwise it won't wind properly. Here are all the parts, cleaned up and drying. Now it's time for reassembly. First the cap jewels go back in. Here's the two that go on the front of the movement. 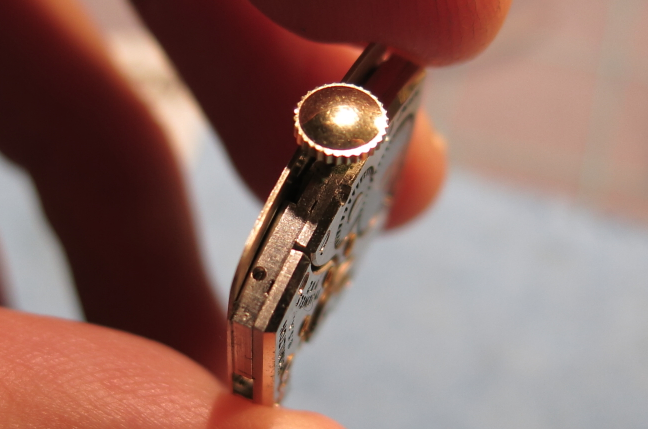 I'll put the setting parts back in while it's in the movement holder like this. On the back, the first part to go back on is the pallet fork. I look at it from this angle so I can make sure the arbor is properly set in the two pivots that hold it. If you tighten the bridge screw with it misaligned you will break an arbor pivot and need a new pallet fork. Next, the wheels go back in. I put them all in at the same time. That allows me to put barrel bridge back on and then use that to help put the train bridge back on. Plus, the train bridge blocks the center wheel so all four wheels need to go in at one time. I look at the wheels from this angle to make sure everything is aligned and to nudge anything needed to get the train bridge to drop into place. Now all the screws go back in, as does the ratchet wheel and winding wheel. 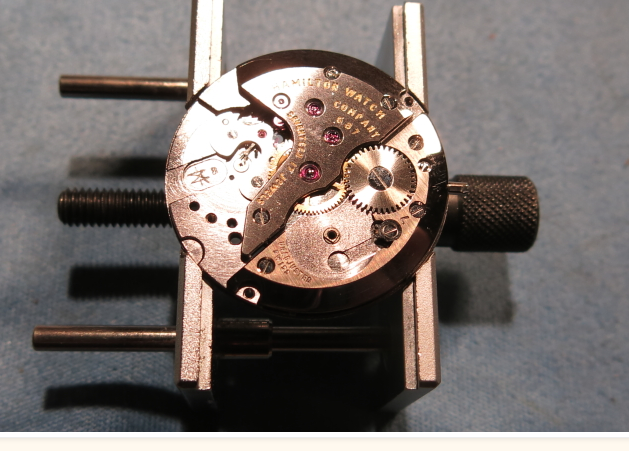 A few turns of the crown will put tension back into the fresh mainspring. The last thing to go back on is the balance assembly. And here it is, back in place and happily running away. Onto the watch timer it goes.... hmm 128 seconds per day slow. Let's check the regulator. Sure enough, it's set to slow. 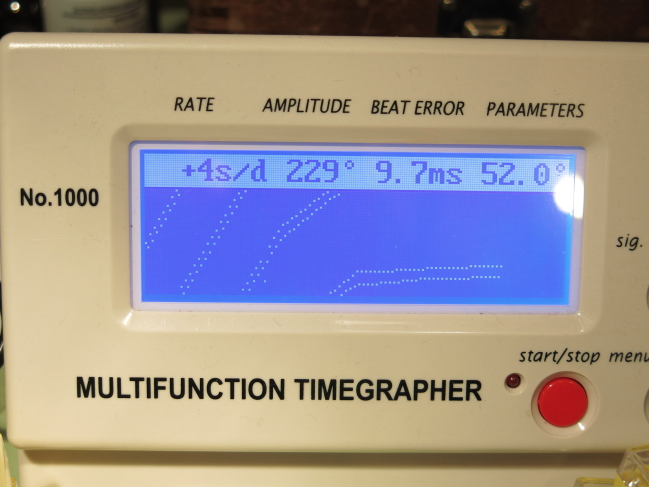 Moving it toward F didn't change the timer results though... that's a good indicator of one thing.... the regulator is not engaging the hairspring. 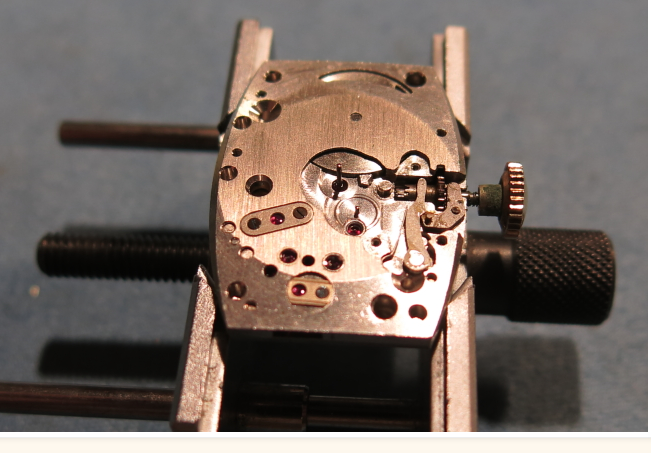 The regulator has two little tangs like a fork that straddle the hairspring. 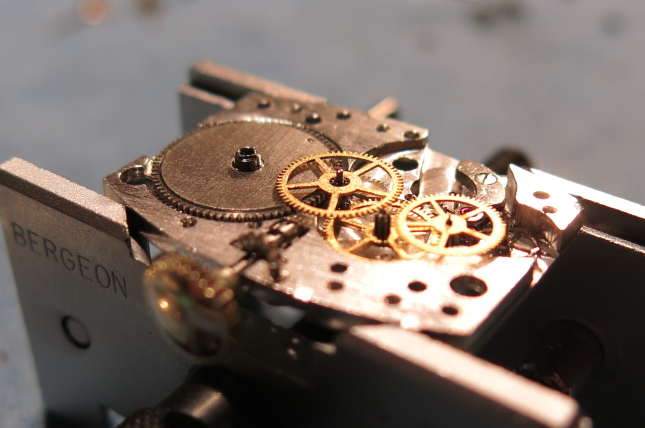 When you move the regulator, the fork slides along the hairspring, effectively lengthening it or shortening it and changing it's speed accordingly. 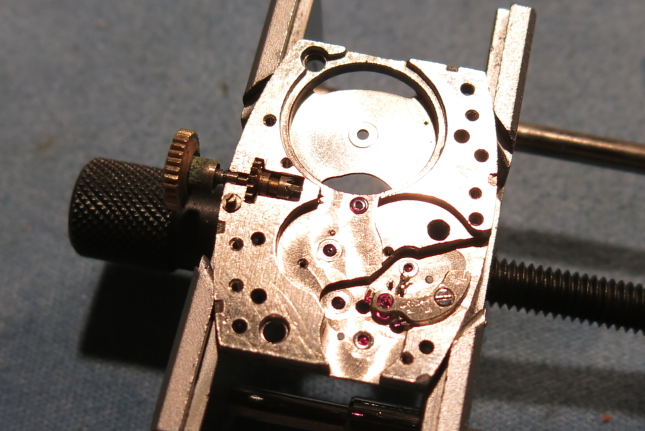 If the fork isn't touching the hairspring, then moving the regulator doesn't do anything. 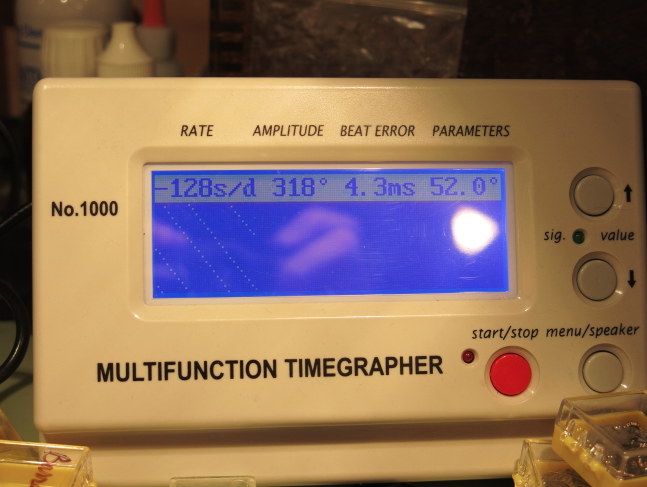 After a little tweaking it's running 5 seconds fast per day... not too bad for a 60 year old watch. 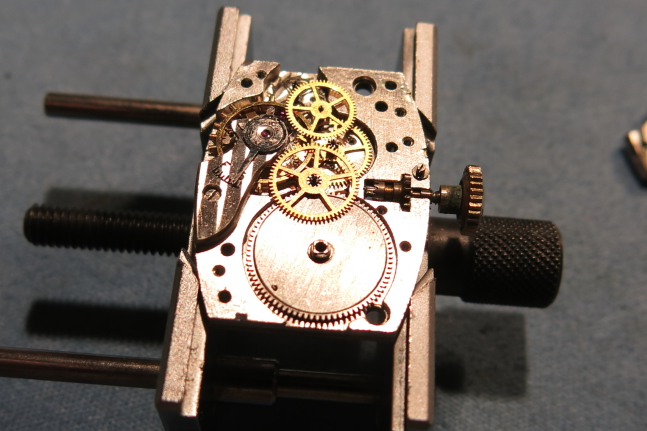 And here it is, all put back together, polished and ready for more wrist time.